Before the holidays I was talking to a few colleagues about my very first e-book. It sold reasonably well, or at least much better than I expected it to at the time, bringing in a little over $4000 in the year and a half it was on the market. It led to lucrative freelance relationships bringing in thousands of dollars in additional freelance writing work. And all of that came from just one weekend of work. Those colleagues I was talking to encouraged me to share the story. So a few tips were shared in the most recent email newsletter about how you can earn thousands from a short nonfiction e-book, even without relying on Amazon and other e-book sellers. Some of that will be covered below (but if you don't want to miss similar updates, you can subscribe to the newsletter in the blue box in the right sidebar). And now I'd like to go into a little more detail so hopefully you can find similar success with your own nonfiction e-books. I drafted a short e-book of approximately 20 pages. Note: this was a traditional .pdf e-book, when 20-50 pages was the norm. These kinds of e-books can still sell well if you target the right markets. But if you feel more comfortable calling shorter e-books "guides" or something else, have at it. I targeted the e-book to my target freelance clients. At the time most of my clients came to me for PR consulting and PR writing (press releases, media kits, ghostwritten trade features, case studies, etc.). The edited file was converted into a .pdf version which was uploaded to my business website. In addition to putting the e-book sales page on my business website (which already reached by target buyers and had decent search engine rankings), I promoted it on forums. This was the primary way it was sold. If you're put off by the warnings that most indie authors don't sell many e-books, pursuing short nonfiction e-books like my example might improve your chances of success. 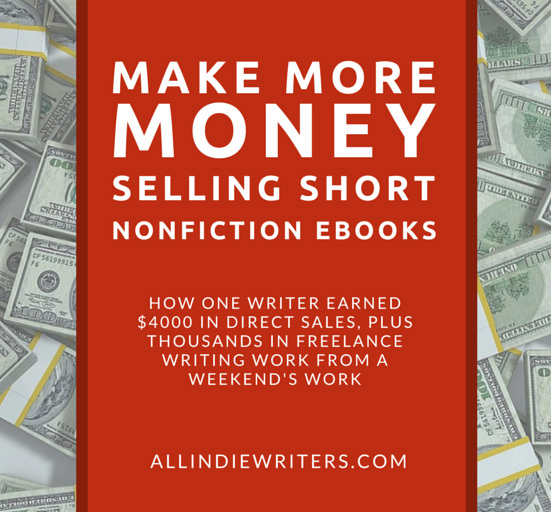 If you can use one short nonfiction e-book to generate five figures of income with a minimal time investment, imagine what you could do by publishing several. I targeted a highly-specific audience -- in this case owners of small online businesses who were brand new to press release writing and distribution and who were hesitant to spend money hiring a PR professional to handle those releases for them. I built a solid reputation in a major forum catering to online business owners, many of whom were in my exact target market. And I was an active member of several others. I focused on giving solid advice related to PR (rather than constantly trying to sell things). That helped me become known as a go-to resource for the business owners hanging out there. The e-book was focused on a very narrow topic -- writing and distributing online press releases. Go too broad in focus and you'll often end up light on information about the specific problems your buyers are trying to address. The e-book focused on actionable information. When your e-book helps readers solve a problem, they're often willing to pay a premium. Again, the more specific the better. People reluctant to hire a professional freelancer are often more willing to try something themselves. Information teaching them how to do that is often cheaper than hiring a pro for a single project, even at a premium (no Amazon pricing mentalities here). That can lead to relatively easy sales. Highly-specific target markets are usually rather small. But by pricing at a premium, you don't have to make a lot of sales to have a profitable e-book on your hands. Bonus points if the information isn't easy to come by (or at least not from trusted sources). I was one of the earlier online PR specialists, which gave me an edge -- there wasn't very much information out there about online-specific press release formatting and distribution when it was released. The e-book could be tied to other income sources. In my case it was tied to freelance writing and PR consulting services. I knew from the start that the initial price wouldn't be the permanent price. But while the demand existed, before others rushed into the market, I made the most of it. But no matter how that turned out, I knew it would pay off more by building trust with freelance prospects.Some bought the e-book, used it to handle their own projects, and I made money from the e-book sale. Others bought the e-book, read it, decided the DIY route looked like too much work, and hired me. And others put the e-book to use with a DIY release, realized that they could have gotten even better results with a PR pro's help, and hired me for their next project.That led to several lucrative client relationships, bringing in thousands of dollars over the years, all in addition to the $4000 or so in direct sales.This is an area where nonfiction e-books shine. It's easy to tie them to other revenue streams to increase your overall return on investment. That might be freelance writing services, consulting, webinars, longer print books, other e-books, e-courses, or any other product or service related to the same target market. Remember. This was my first e-book, created largely as a test and mostly as an authority piece. While its success made it a very profitable project, I'd consider it a moderate success at best. With a little more time to sink into a premium-value e-book or guide (and an ability to tie it to a larger revenue plan), you can earn even more than I did. Have you ever used this kind of short nonfiction e-book to promote other services or products? Did you extract direct income from it through sales first, or did you go right to a free release? Tell us about your niche and how similar strategies worked within it by leaving a comment below. How much time did you spend in the forums? How did you balance your personal writing projects with client projects? Life? 🙂 I want 2015 to be one an Awesome year. However, I need to examine where I spend my time. At that point I was a member of the main forum for maybe 8 months or so (at most), and I had joined the others from a few months before the launch to around the time of the launch. But most of my energy went into the first one. You can’t just jump in and expect make immediate sales. So it’s best to use your existing online presence whenever possible (for many writers that might be social networks rather than forums, but forums are still very popular — and less saturated — for this particular target group). And the best way to do it is to offer tips and answer questions — be generous in sharing what you know. People see that you know what you’re talking about, they like that you’re willing to take time to help them when you can, they grow to trust you, and that makes them much more likely to buy from you. – Have a regular schedule. You don’t always have to stick to it perfectly, but if someone wants something and it’s outside of those normal business hours, it’s much easier to say “no.” It also helps set client expectations and helps you with scheduling other things. Thanks for this, Jenn. Just the inspiration I needed. Also your comment about treating your own projects as important is so true. Failure to do so means you always neglect them. That’s something I’m addressing this year. Thank Jenn for your comprehensive response! I want to get out a series of small, non-fiction ebooks this year. In this era of free reports/ebooks, whatever you want to call them, I’d be interested in your take on how successful that strategy would be. Using your points above (of course) ;-), particularly on highly-specific target & subject. Giving them away for free from the start would certainly work. I went the premium route in the beginning because there were literally no other guides like that written about that exact topic, and directed at my target clients. Basically, people would ask me the same questions all the damn time when we were discussing potential projects, and I realized I’d make more by putting the information out there in e-book form. If you’re working in a more saturated niche or industry, free might be the best way to get attention. But I’d only do that with a clear revenue path in place. Series in general are always a good idea because you increase your opportunity for first contact when you can target different buyer problems. I have several series of short e-books coming out (three different sites, four different series). I’d originally planned longer e-books, which is why it was taking me so long to get through them all. So now I’m breaking them down into shorter (and cheaper) guides on individual topics. Hi Jenn, excellent piece. Good reminder for freelancers that while Kindle publishing is great, there are other options as well. Information sells, and who better to sell it than freelancers, as an added income stream? I’m a big fan of free reports, as well as of short ebooks you sell. They give you credibility, and you can use them as a writing sample. And of course, they bring in some cash. Hi Jenn I love this article. I have been getting alot of information together to write several ebooks, especially on how to do…I started out knowing nothing about the internet and have learned so much and want to share my knowledge the the short cuts learned along the way.